There are so many interesting facts about this holiday! 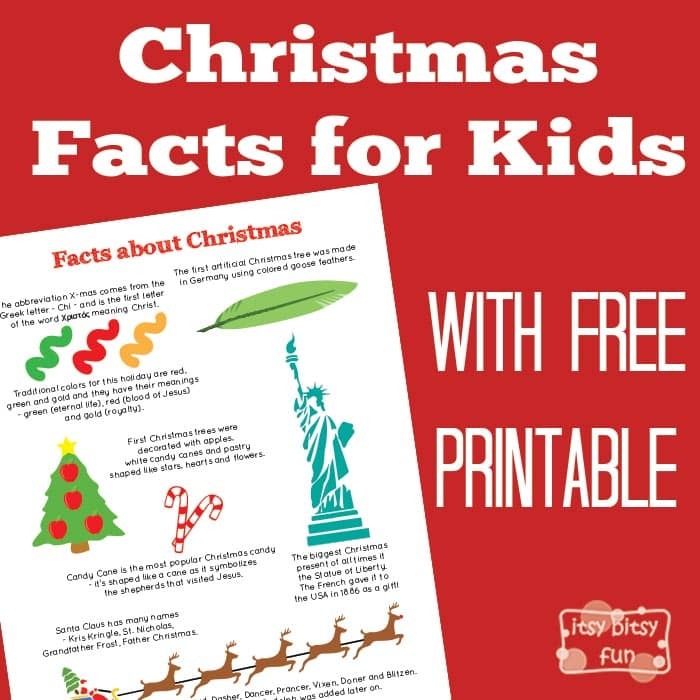 Let’s learn with facts about Christmas for kids! Once they are done reading through these they might also enjoy the reindeer facts for kids as these magnificent animals go hand in hand with all things Christmasy. Unlike my other educational pages I wouldn’t exactly call the information on this page as facts – more like beliefs and common interpretations. Like you know Christmas is celebrated as the birth of Jesus as some people believe and others don’t this “fact” really isn’t a face – if you get me? To each their own I always say! 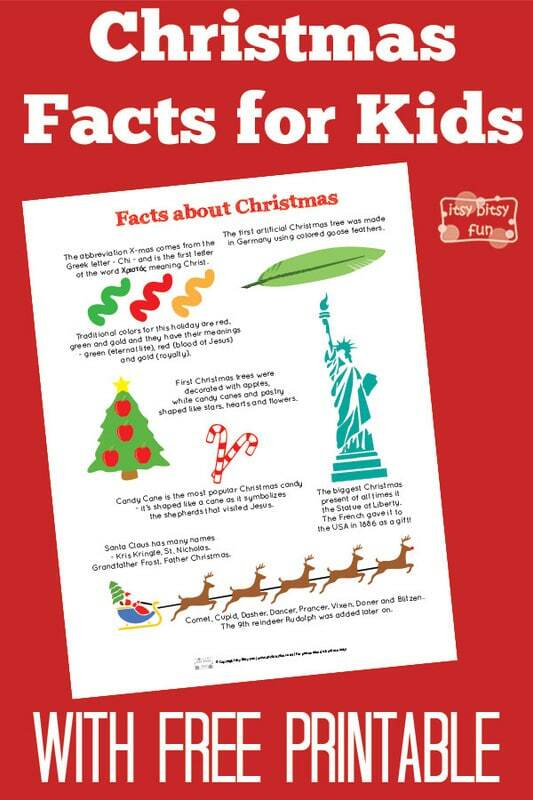 Well not to mention there are some facts that could destroy Christmas for kids so in the festive spirit let’s leave those out from the printable :). Let’s learn something about this fun holiday shall we? The first artificial Christmas tree was made in Germany using colored goose feathers. Traditional colors for this holiday are red, green and gold and they have their meanings – green (eternal life), red (blood of Jesus) and gold (royalty). The abbreviation X-mas comes from the Greek letter – Chi – and is the first letter of the word Χριστός meaning Christ. The biggest Christmas present of all times it the Statue of Liberty. The French gave it to the USA in 1886 as a gift! First Christmas trees were decorated with apples, white candy canes and pastry shaped like stars, hearts and flowers. Candy Cane – a cane shaped candy is the most popular Christmas candy – it’s shaped like a cane as it symbolizes the shepherds that visited Jesus. We Wish You a Merry Christmas is the most popular Christmas song! During a short period of time in the 17th century Christmas was banned in Britain. Santa Claus has many names – Kris Kringle, St. Nicholas, Grandfather Frost, Father Christmas. Santa has 8 raindeer – Comet, Cupid, Dasher, Dancer, Prancer, Vixen, Doner and Blitzen. The 9th reindeer Rudolph was added later on. Reading the facts is one thing (and it can be sufficient if your kid is a reading type) but visualising things can be even better. That’s why I’ve created this fun printable with most of these facts illustrated to help kids “learn” about them. Combined with other printables they can even create their own fun fact book!